If you have been sitting on the fence about this fufulization movement, I am sure that with Spinach Fufu, you can now come over to the bright side and believe that everything can be fufulized. Operation Fufulize Everything! In case you are wondering, I served it with Sunflower Seeds "Egusi" Soup in the image above. Click here for the recipe for that alternative Egusi Soup. Spinach Fufu is low carb and keto friendly when you use the first set of ingredients listed below and serve it with a keto-friendly Nigerian soup. As with all Nigerian fufu meals, Spinach Fufu is served with Nigerian soups for fufu meals. Click here for Nigerian Soups Recipes. If you are on a strict low carb diet, serve it with Nigerian soups that do not contain high carb ingredients such as Ogbono Soup, Nigerian Okra Soup, Edikang Ikong Soup (Vegetable Soup), Miyan Kuka, Efo Riro, Banga Soup and any other Nigerian soup that does not contain a starchy thickener. For any other person that is not on any special diet, serve with any Nigerian soup. Where I live, I can buy frozen ground spinach from the frozen foods section of my local supermarket. Look for this in your local supermarket too especially if you live outside Nigeria. Remember, the spinach is ground (grinded). There is another type of frozen spinach that is merely chopped, that one will not work well with the spinach fufu recipe. Instead of ground frozen spinach, you can use leafy spinach, ugu, green amaranth, kale and other leafy vegetables to prepare spinach fufu. If it is what you are using, please read the Before You Prepare Spinach Fufu section below. Psyllium husk is a low carb binder that will make the spinach fufu moldable so we will be able to make balls of fufu with it while eating. Spinach on its own cannot be molded into fufu balls. Psyllium husk is all natural but please read up on it to be sure it is good for you before you use it. See where to buy it from below. 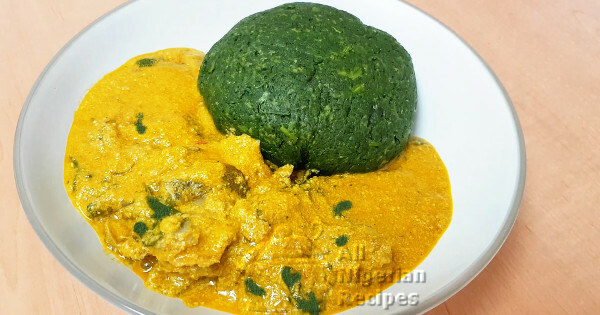 Spinach fufu prepared with psyllium husk is for those on a strict low carb diet such as the ketogenic diet while spinach fufu prepared with oat flour is for every other person. In method 1, instead of psyllium husk you can use arrow root powder to bind the spinach fufu. In method 2, instead of oat flour you can use semolina, wheat, corn flour, cassava flour to bind the spinach fufu. Bring out the ground frozen spinach the evening before the day you will make it. Set it on your kitchen counter to defrost naturally on its own. By lunch time the next day, it should be perfectly defrosted. See video below. If you are using leafy vegetables, pick and rinse them thoroughly then chop and blend with as little water as possible. Sieve to remove the water and set the sieved vegetables aside for the fufu. You can drink the water if you wish. Put the defrosted vegetables into a pot and start cooking on medium heat. If using leafy vegetables, put the sieved vegetables in the pot and start cooking on medium heat. When it heats up, stir for 2 minutes and add the psyllium husk or the oat flour depending on which binder you are using. Mix again for about 2 minutes or till well combined and a dough starts to form. Wrap it up and serve with a Nigerian soup for swallows. Serve Spinach Fufu with any Nigerian soup for fufu meals but if you are on a strict low carb diet, serve with the low carb Nigerian soups mentioned above.